There's some good coverage of yesterday's ceremony for the National Guard members heading to Kosovo in the First District's media. "We have the best National Guard in the United States of America," said Pawlenty. "There are children, women and men in Kosovo whose lives will be saved because of our presence there. May God continue to bless the United States of America by continuing to give us these heroes." Pawlenty presented a Minnesota flag to Company F Commander Capt. Dale Ross. Rep. Tim Walz also spoke at the ceremony, thanking soldiers and families for their sacrifices. "You represent us as the best America has to offer," said Walz. "We are the leaders when it comes to freedom. We are behind you, we are behind your families and we are behind your mission." Sgt. Rebekah Miller of Minneapolis said she is excited about what will be her second deployment to Kosovo. In 2004, she spent seven months working as assistant to the chaplain. This time, she will be building relationships with community leaders and focusing on problem-solving. "It's a really great mission," said Miller. Her husband, Stephen Miller, said he is really proud of his wife, but said it's even harder the second time around. "The first time she was deployed, we had been married for three months," said Stephen. "This time, it's harder because the longer I know her, the more I like her." 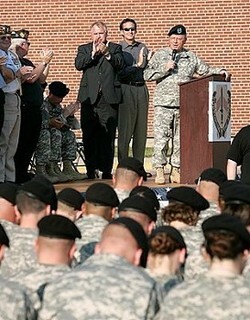 When it was Bravo Company, the local National Guard soldiers were mobilized and deployed to Operation Iraqi Freedom. Including pre-deployment training they were gone from their hometowns and families for most of 2005. Now, 18 months later, they will be separated again. Emmanuel, 22, graduated from high school in 2003 and enlisted in the Minnesota National Guard. His job in the National Guard is as a truck driver. That's what he did when he was deployed with the old “Bravo Company” soldiers before the redesignation to Fox Company. He missed a few holidays then, but came home, as his mother wished then, safe. Pawlenty presented a Minnesota state flag to Capt. Ross which was flown in Kosovo by another state National Guard unit that served in Iraq. These troops will miss out on Thanksgiving and Christmas with their families this year, but they say they're okay with that. Instead they're focusing on how they'll be making a difference in someone else's life in Kosovo, and to them it's worth the sacrifice to help keep the peace in our world. Members of the 1st Minnesota, or the 2nd Battalion of the 135th Infantry gathered with their families at the Austin Armory. Many of the troops say they are excited for the trip, looking forward to helping. "The personal skills, and speaking with people, and being able to exercise personal skills," says PSC Tessa Heathman. Governor Tim Pawlenty and Congressman Tim Walz assisted in the ceremonies, reminding the troops of how their work will be valued. There's an accompanying video clip on the page with the story. KTTC features more coverage here, and KEYC covered the send-offs in St.Paul in Prepare To Leave For Kosovo.